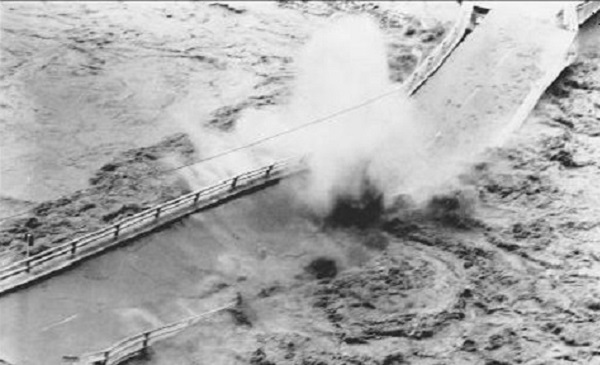 By most accounts, the Highway 49 bridge blowout of December 1964 was spectacular. The Dec. 23, 1964, bridge washout put traffic on the Mountain Quarries Railroad Bridge for four months, and a new Highway 49 bridge was in place by spring of 1965. That year was also when the Auburn dam project was authorized by Congress. Though the dam was never built, the possibility that it would be constructed left the option of doing nothing open. The downstream rubble and steel the washout left behind would soon be under hundreds of feet of water. Almost 50 years later, the dam has yet to be built and the remains of the bridge have yet to be cleared away – leaving a quandary for several levels of government, as well as environmentalists advocating greater use of the Auburn State Recreation Area as a park. During fall days like Wednesday, when the American River flows are down to their lowest levels of the year, the mangled steel can be seen clearly in the river bed, some of the pieces poking up above the water line. The broken concrete – giant gray chunks weighing several tons – litters the canyon shoreline. Elias Silver of the Lake Tahoe area was at the shoreline skipping stones with friends as their dogs romped in the calm, meandering waters at the confluence below the newer Highway 49 bridge.